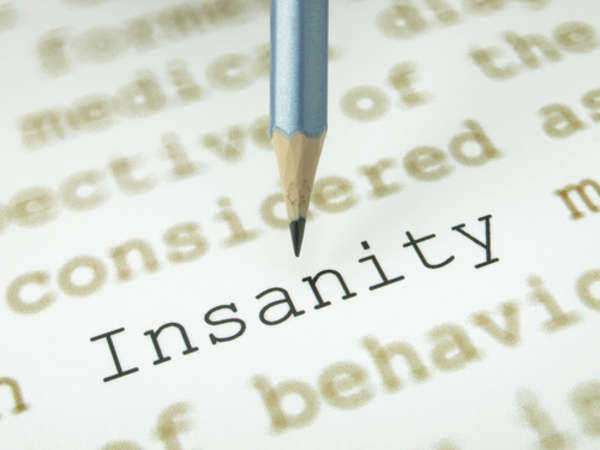 An insanity defense can only be successfully mounted if it fulfills the requirements laid out in the law. The defendant cannot be excused for his or her actions simply by claiming he or she is insane. Most jurisdictions in the United States currently require placing the burden of proof on the defense to show that the defendant is insane. The standard required to prove an insanity defense is based on social norms. Insanity in the courtroom is not to be confused with the medical definition of mentally ill. Although the two share some similarities, the legal definition can be found even if there is no medical basis for the finding, and a medical diagnosis of mental illness does not automatically equate to a legal ruling of insanity. Did the accused know what he or she was doing? Did the accused know that what he or she was doing was legally wrong? The irresistible impulse test is also known as the policeman at the elbow test. It establishes the idea that an individual can be found to be insane if he or she is unable to restrain him or herself from acting. In other words, his or her actions are the result of an irresistible impulse. Critics argued that the Irresistible Impulse Test allowed insanity pleas in instances where the crime was the result of an uncontrolled impulse, not an irresistible impulse. The Durham Test was the first standard which allowed a previously diagnosed mental illness to be submitted as part of an insanity defense. It is also known as the "Product Test" because it exempts the act from being prosecuted as criminal if the event is determined to be the product of the defendant's mental illness. The Model Penal Code, or MPC, Test was developed by the American Law Institute in 1962 and underwent substantial revision in 1982. Upon its revision it became the standard basis for the penal code used in much of the United States. The MPC sought to address criticisms that had been leveled against the M'Naghten Rule, Irresistible Impulse Test, and the Durham Test. It considers the defendant's ability to recognize the legality of their actions, which is take from M'Naghten. It allows for pleas of temporary insanity, which is related to the Irresistible Impulse Test and it incorporates the Durham Test by allowing the defense to present evidence of preexisting mental instability.